ISIS’s foreign fighters: Will the Americans and Europeans flocking to the jihadist group return as hardened terrorists? Will the Americans and Europeans flocking to ISIS return as hardened terrorists? 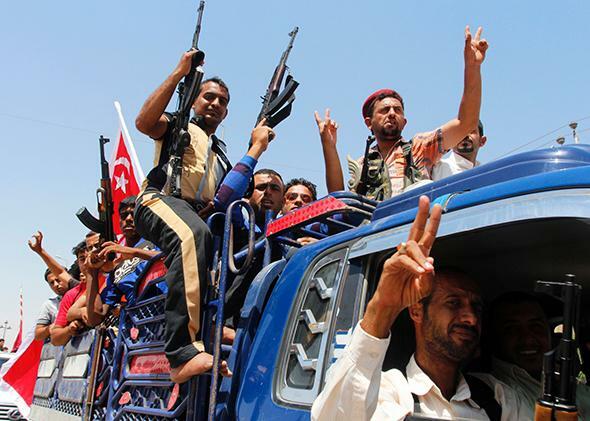 Volunteers from the Badr Organization, who have joined the Iraqi army to fight militants from the Islamic State of Iraq and Syria, chant slogans in Basra on June 14, 2014. Will their opponents attempt to wreak havok in the West next? Global terrorist enterprises inspired by al-Qaida’s ideology pose a continuing threat to the United States. That threat has been enhanced by the presence of thousands of foreign fighters who have joined al-Qaida offshoots Jabhat al-Nusra and the Islamic State of Iraq and Syria, or ISIS, now known as the Islamic State. Armed with Western passports and “clean skins,” these Western volunteers can more easily get past security measures to threaten commercial aircraft or carry out other terrorist operations in the West. When these battle-hardened veterans come marching home, will they seek to bring the violent jihad with them? The United States has some historical experience. Since 9/11, 111 Americans have gone overseas to join jihadist fronts or seek training from terrorist groups abroad. Forty-seven were arrested on the way, 64 of them connected with jihadist groups abroad. Fewer than half of these returned; some were arrested abroad, some remain at large. The rest were killed—some in suicide bombings, two by U.S. airstrikes, at least two by their terrorist comrades. So far, training abroad has not been a significant factor in motivating post-9/11 terrorist attacks. Only six of those who received training abroad plotted terrorist attacks after their return to the United States, and only one actually carried out an attack, which failed. Individuals who spent time in Yemen and Russia carried out attacks in the United States, but there is no evidence that they ever hooked up with any terrorist group during their travels. The deadliest attack since 9/11 was the shooting at Fort Hood by Army Maj. Nidal Hasan, whose only connection with terrorists was through the Internet. U.S. authorities estimate the number of American nationals or legal residents who have gone to Syria or Iraq since 2011 at somewhere around 70 to 100, more than previously went to Afghanistan, Pakistan, Yemen, or Somalia, but not a huge increase. Europe faces a bigger problem, with as many as several thousand Europeans in the ranks of the jihadist groups—hundreds reportedly have already returned, but here again there have been few terrorist plots. One ISIS veteran among them shot and killed four people at a Jewish museum in Brussels. Another was arrested preparing for terrorist attacks in France. Authorities worry that Western volunteers might be equipped with the latest miniature explosive devices and sent to sabotage airliners, like Richard Reid, the shoe bomber, or Umar Abdulmutallab, the underwear bomber. Increased security for U.S.-bound flights from Europe and the Middle East reflects concerns arising from possible cooperation between al-Qaida’s talented bomb-makers in Yemen and jihadist groups in Syria with ready access to Western volunteers. It is not just the returning Americans who pose a threat, but returning Europeans who can travel to the United States without visas. But the threat posed by Western fighters in Syria and Iraq is much broader than that and could take the form of attacks on the homeland directed and launched from abroad, terrorist training without specific operational orders, or individuals simply applying acquired skills to plan and carry out their own attacks. Europeans worry that returning fighters might engage in less sophisticated, small-scale, but deadly, attacks. For now, the flow of jihad-inspired manpower is from the West to the Middle East. An end to the fighting, which is nowhere in sight at the moment, could reverse the flow. U.S. airstrikes aimed at destroying the jihadists before they can establish new safe havens from which to launch terrorist attacks could scatter the militants, but would also give them cause to seek revenge. Those who succeeded in joining the jihadist fronts presumably are more determined than their stay-at-home brothers. Survivors will return with their scars, war stories, and prestige. Presumably they will be more competent than the terrorist plotters seen thus far since 9/11, although most of their experience presumably will be in ordinary combat, not specialized terrorist training once offered in al-Qaida’s training camps in Afghanistan. Some will be disillusioned by the fact that they were participating in campaigns to kill other Muslims. Some will be psychologically damaged. The Islamic State may lose its luster. Absent military intervention, preventing new attacks will remain a matter of defense. The major challenge will be in the realm of intelligence, which thus far has been successful in uncovering terrorist plots. But U.S. intelligence efforts themselves are being challenged at home and abroad. Domestic criticism of intelligence collection programs has mounted while revelations of electronic surveillance programs have provoked worldwide anger and threatened international cooperation. U.S. authorities recognize the threat and are pushing to identify all of those who have gone to Syria or Iraq. European governments are even more concerned than we are, but are not yet consolidating data as efficiently as they might, and they are less willing or, under the political pressure caused by the Edward Snowden revelations, less able to share information with the United States. Some in Europe object to creating any large databases loaded with personal information on grounds that this is precisely the kind of Big Brother thing the Americans do. Either way, the terrorist threat is evolving, and we have little choice but to evolve with it.